Bloons Supermonkey 2 Is A Great Timekiller Game By Ninja Kiwi. 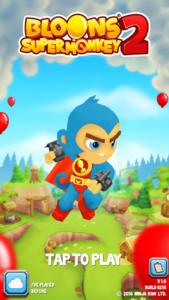 In This Game, You Play As A Supermonkey With The Goal To Stop Balloons, Collect Power-Ups, Weapons. Just Hold Down The Thumb And Move Your Monkey Where You Want. 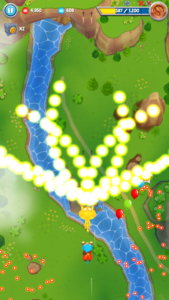 Shoot All Balloons With Darts. There Are Varieties Of Ballons Which Interact With You Like Red, Blue, Gold. Shoot All Mystery Ballons To Collect Power-Ups, Don’t Miss Gold Balloon Which Increase Your Strength And You Will Be Able To Shoot All Balloons. When You Will Be Busy In Shooting, Some Catch Box Will Drop Out, Catch Them To Use In Next Levels. You Can Pick Any Two Cards Before You Start A Level. Lab – In Lab, You Can Upgrade Your Weapons Like Left Arm Darts Or Right Arms Darts. But You Need Bloops. 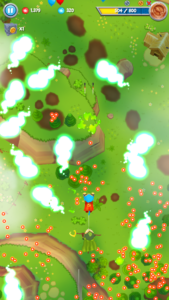 You Can Purchase Bloops With Real Money. You Can Download This Game From Google Play Store. Price – $1. You Should Try This. If You Don’t Like It Then You Can Refund Your Purchase[With In 48 Hours].